"Women are like apples on trees..... The best ones are at the top of the tree. Most men don't want to reach for the good ones because they are afraid of falling and getting hurt. 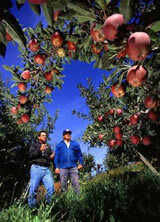 Instead, they sometimes take the apples from the ground that aren't as good, but easy. The apples at the top think that something is wrong with them, when in reality, they are wonderful. They just have to wait for the right man to come along, the one who is brave enough to climb all the way to the top of the tree." Ladies, Encounters International will reduce this wait for you because it attracts exclusively the type of men who have the desire, the means and the commitment to go all the way to the " top of the tree". Like anything of real value in life they do not come in big numbers. You all know that surfing "foreign brides" sites is a very popular pastime among single men in Western countries. I know from statistics and you know from your own experience that only one out of ten corresponding men would actually travel to Russia at some point of his life while nine men will just stop corresponding. Also, you know that one out of every ten men who actually travel to Russia will propose and file for a fiancee visa while nine will leave and you will never hear from them. Encounters International's statistical record is strikingly different. Nine out of ten men who you will see in the database are ready to travel and only need an incentive (that could be you! ), nine out of ten men who travel are going to propose to the right woman and petition for a fiancee visa. Nine out of ten men will be moved from the database into Our Matches page within one year. I am sure that you appreciate the difference Encounters International clients make when it concerns the seriousness of intentions. Ladies, if you want to be considered for EI membership please fill out the form below.